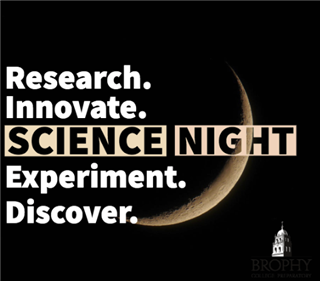 Brophy's Science Department in collaboration with the Science Journal of Brophy presents Science Night: a science fair, makers fair, lab demos, TGen and Grand Canyon University scholars' presentations, plus, take a look at the new Anatomage in our one-of-a-kind Sports Medicine Department. Join our vibrant science community for an evening of exploration Wednesday, Feb. 20, 6-8 p.m. The event starts in Graham Plaza.